The Higher Education Commission has updated the online status of students whose data were added, checked, finalized for selection or rejection under Prime Minister National Laptop Scheme. Laptops have already been awarded in a number of universities from all provinces of Pakistan in recent months. The data of students were added online by the students themselves, then verified or rejected by the concerned universities, and if found eligible by HEC their status are then updated. Therefore, data has been marked as Verified, Disapproved, Selected, Not Selected, Not Eligible and Eligible but low CGPA. Applied: Student has successfully submitted his/her application for new registration. Verified: Student record have been confirmed by the concern university focal person. Asset Issued: Student have already been issued a laptop in previous scheme(s) / Phase(s). In case of any discrepancy, kindly contact your university’s focal person. Selected: The student is eligible and selected in the merit list. Not Selected: The student is eligible but not selected in the merit list due to limitation of the laptops. Not Eligible: The student record is approved but does not meet the eligibility criteria. Eligible but low CGPA: Date of Admission and duration criteria is fulfilled but the student does not meet the minimum CGPA requirement. 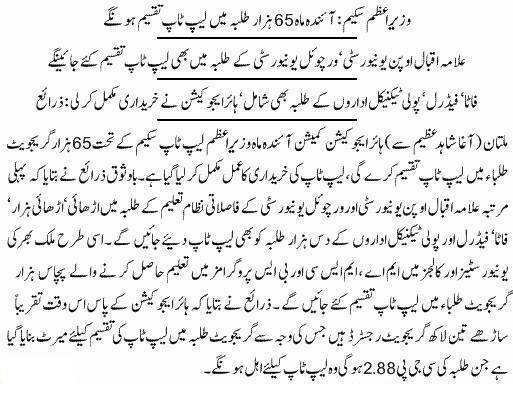 Students of more than half of the universities have been awarded laptops already as distributions of laptops are going on these days on priority basis in every part of country. The data of remaining students will be updated in a few days, in case the same has not yet been done. In case you have some query, you may contact Higher Education Commission of Pakistan or comment below for discussion regarding distributions of laptops. What about the students of Comsats Attock campus? No laptop have been issued to bachelors levl yet. We students of b.tech electrical are approved for laptops scheme. When it will be given to us. i got 3.56 gpa but i m in not selected but may class fellow got 3.49 gpa and he is selected how it is poaible? How to check selected students list??? I’m the student of university of malakand ,and my CGPA is 2.95 but mistakely i casted it 2.97 .So will i be able to get laptop? Iam student of UPR (DEPARTMENT OF CHEMISTRY).My cgpa is 3.89 in last exams but mistakely i casted it 3.47 and that was varified so kindly i request for correction so that i can become eligible. Pora saal hony ko ha ye laptop de rhy hn ha ya behria town me ghar?? how to update my record? How i update my data…….? When i update my data my collage not found in eligibal list…..
Mera name eligible list me tha or Mera status verified aya to selected list me q nai aya? Verified se kia mtlb smjhun me phr?? i am eligibael but not selected my GPA is 3.29 and some of our classfellows are selected only on 3.2 etc so plzzzz tell me sir that is the reason that i am not selected. laptop kb milny gcuf k students ho? I’m eligible for laptops scheme but I not select for laptop why sir?? Sir I am selected but my name is not in verification list. Hello my CGPA was good enough but not got laptop.may i know why? Sir iam verified in laptop scheme. Exit result. Please help me. Sir how to know that selected or not selected?…..plz tell me?